Julie Hall is finally adjusting to her new career: locating dead bodies with dowsing rods. The crime scene is drenched with blood, but the body is nowhere to be found. When a grieving mother requests Julie’s help tracking the body of her missing daughter, Julie is hesitant. Not only do the circumstances sound disturbing, the job is in her hometown, a place steeped in upsetting memories and unresolved trauma. But her interest is piqued, and she takes the case, knowing she’ll have the support of her FBI agent boyfriend along the way. Soon, Julie finds herself exactly where she doesn’t want to be—trapped in the dangerous spotlight created to keep the story in the media. 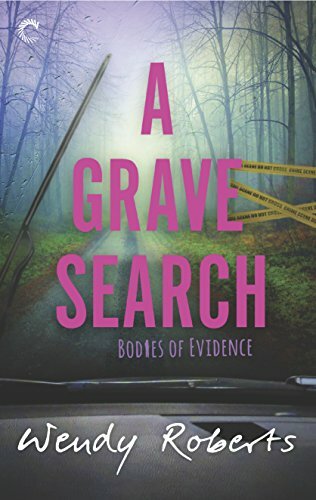 And as she digs deeper into the mystery of the young woman’s death, she uncovers secrets about her own past she thought were buried forever. And don’t miss the first installment in the Bodies of Evidence series. A Grave Calling is available now from Wendy Roberts and Carina Press!